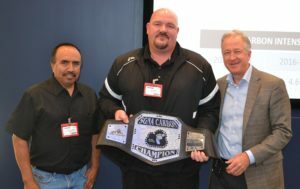 Winners pose with their WWE (Waste, Water, Energy) belts at the Sustainability Summit. Saint-Gobain North America’s Sustainability Network held its 3rd annual Summit at the Nalco Water Headquarters in Naperville, Illinois. CertainTeed plants took home three of the six possible awards for applying innovative excellence to environmental practices. 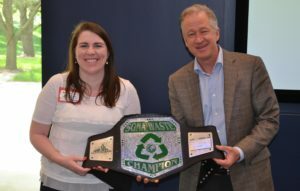 President & CEO Mark Rayfield personally awarded winners with WWE belts, which represent Saint-Gobain’s 2025 environmental goals of Water, Waste and Energy. When the two-day conference concluded, representatives from CertainTeed plants returned to their respective cities as environmental champions, awarded in the categories of Carbon, Waste, and Overall. 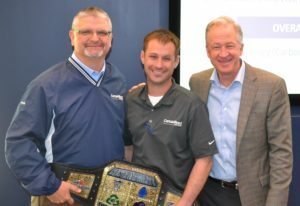 CertainTeed’s plant in Avery, Ohio received the belt for Overall Champion of Sustainability. CertainTeed Roofing in Wilmington, California took home the title of Carbon Champion, represented by Plant Manager Jay Griffith and Plant Engineer Heriberto Luna. Through the combined efforts of LED lighting upgrades, a trial for an electric forklift, and the use of a more efficient air compressor, the Wilmington plant was able to reduce its carbon intensity by a hefty 50.4% from 2015-2017. CertainTeed’s Wilmington, California plant took home the title of Carbon Champion. From Roxboro, North Carolina, CertainTeed Gypsum received the award for Waste Champion by striving for a waste intensity reduction of 65.9% from 2015-2017. The plant achieved the waste reduction goal through aggressive recycling of both board and general waste. Catherine Collison, the North American Energy and Process Champion, was there to receive the award. From Roxboro, North Carolina, CertainTeed Gypsum was named Waste Champion. And finally, SGNA proudly recognized CertainTeed Roofing in Avery, Ohio as the Overall Sustainability Champion, represented by Plant Manager Troy Fronzaglio and EHS Manager Andrew Caloway. They achieved their results through the joint efforts of a multidisciplinary team focused on areas including operations, environmental, and granule reduction. Through its hard work, the team approved 15 energy and waste reduction projects during 2017, saving a total of $329,000 throughout the year. Plus, CertainTeed plants aren’t the only ones pushing the limits of environmental design, learn how the corporate headquarters became a sustainability behemoth.